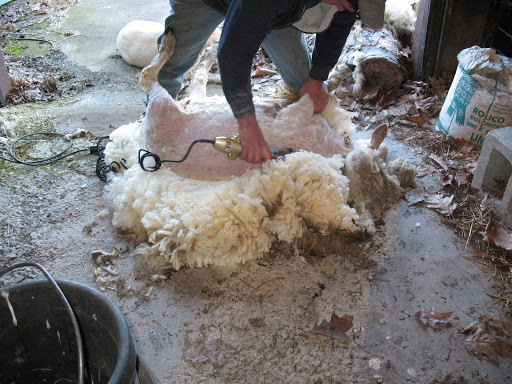 Another rite of spring around Touchstone Farm is the shearing of the sheep. 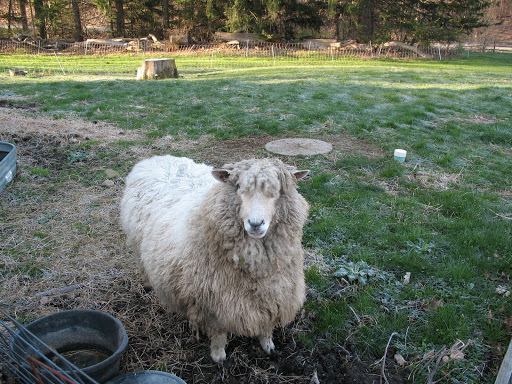 Since we only have 1 old ewe any more it took about 20 minutes. Quite a change from the old days when it took most of a morning and there were little lambs everywhere bleating for their mommas. Here is our hairy, Hayleigh girl before her yearly do. Not her best angle. 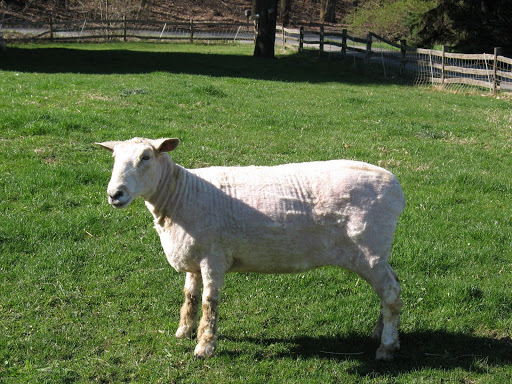 She has had too many lambs to have any false modesty. It was 25 degrees this morning when the poor old girl got her haircut so I’m not sure she was as grateful as some years when it is 70 degrees and she can’t wait to feel the air on her skin again. 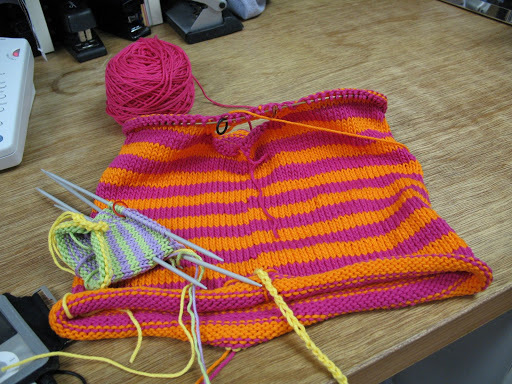 On the knitting front I am plugging away on a tiny little cardigan for my friend’s first grand-daughter. I thought it would be sooo cute in big stripes of hot pink and orange. And it was until I wound the second ball of Cotton Classic and realized it was a completely different dye lot, maybe even a different hot pink than I had used for the body. I have mountains of Cotton Classic which I often use for my kid designs. I was not about to buy more. So I have come up with what I hope is an acceptable solution. 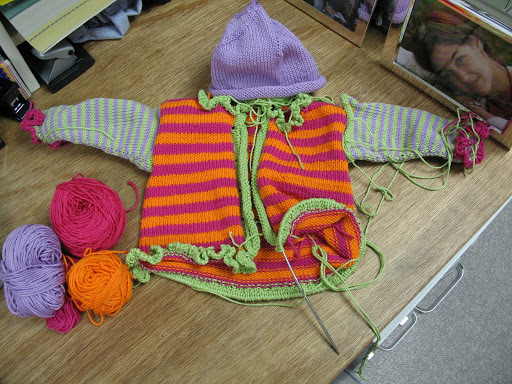 Which I also hope to tie together with the matching hat and booties or socks. I should be done in a few days so will let you all in on it and you can give me your thoughts. I think it will work,but then I love bright colors on little ones, and the brighter the colors the better if the little ones are really little. How does it strike you so far? Is it too much even for a tiny little girl? I don’t want her to look like a clown. I think I am OK and that it has more of a We Sing in Sillyville flavor to it. Of course, I am spending vast amounts of time with 5 and 6 year olds so my senses may be muddled. Love the pictures of Hayleigh getting her haircut. I may actually take them to Aaron’s preschool on Monday. They’re doing a “farm” theme at the moment, but most of the pre-k kids are losing interest in pretending to pick vegetables every day, so I’m taking in my wheel and some wool to show them how it becomes yarn. Miss Hayleigh can be my visual aid! 🙂I think the sweater is cute!